Over the weekend, I was reviewing some old commentary and stumbled across a piece from 2012 which contained an excerpt from Jeremy Grantham who is the famed investor at GMO. 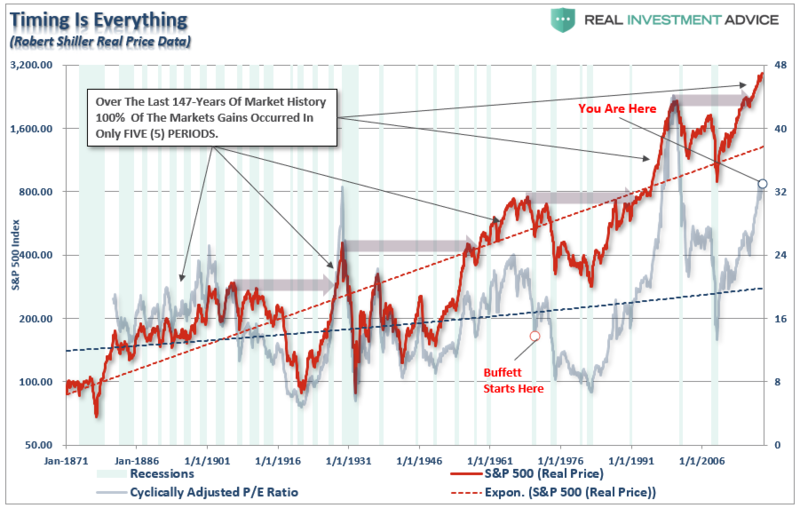 I have spoken, and written many times in the past, that the media and Wall Street alike promotes the bullish and optimistic views not because it is correct – but because it sells product. 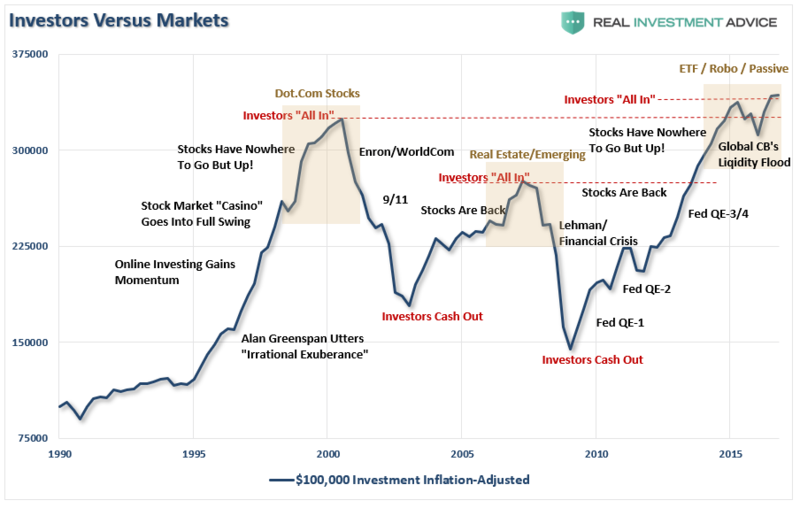 There is no value in telling the retail investor the truth about the risks in the market because investors would pull money out of the market which would reduce Wall Street’s profitability. In other words, the bullish and optimistic marketing machines are good for their bottom line – just not necessarily yours. This is one of the primary points that Jeremy Grantham brought out in his commentary. This is a read which is well worth your time and consideration. It speaks to the very issues that we address most often about understanding the long-term risks to your portfolio, investment rules, and the legacy that we are leaving to our children. It was refreshing and enlightening in 2012. It is just as important and educational today. I have added illustrations to support his points. For individual investors setting out on dangerous investment voyages. Believe in history. In investing Santayana is right: history repeats and repeats, and forget it at your peril. All bubbles break, all investment frenzies pass away. You absolutely must ignore the vested interests of the industry and the inevitable cheerleaders who will assure you that this time it’s a new high plateau or a permanently higher level of productivity, even if that view comes from the Federal Reserve itself. No. Make that, especially if it comes from there. The market is gloriously inefficient and wanders far from fair price but eventually, after breaking your heart and your patience (and, for professionals, those of their clients too), it will go back to fair value. Your task is to survive until that happens. Here’s how. Don’t put all of your treasure in one boat. This is about as obvious as any investment advice could be. It was learned by merchants literally thousands of years ago. Several different investments, the more the merrier, will give your portfolio resilience, the ability to withstand shocks. 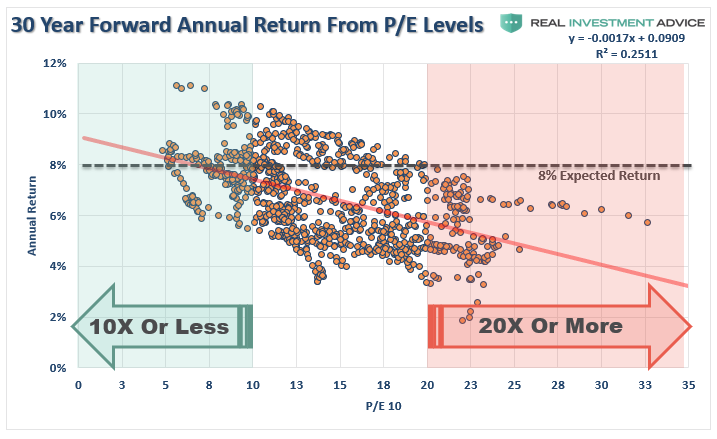 Clearly, the more investments you have and the more different they are, the more likely you are to survive those critical periods when your big bets move against you. Be patient and focus on the long term. Wait for the good cards. If you’ve waited, and waited some more, until finally a very cheap market appears, this will be your margin of safety. Now all you have to do is withstand the pain as the very good investment becomes exceptional. Individual stocks usually recover, entire markets always do. If you’ve followed the previous rules, you will outlast the bad news. Try to contain natural optimism. Optimism has probably been a positive survival characteristic. Our species is optimistic, and successful people are probably more optimistic than average. Some societies are also more optimistic than others: the U.S. and Australia are my two picks. I’m sure (but I’m glad I don’t have to prove it) that it has a lot to do with their economic success. The U.S. in particular encourages risk-taking: failed entrepreneurs are valued, not shunned. But optimism comes with a downside, especially for investors: optimists don’t like to hear bad news. Tell a European you think there’s a housing bubble and you’ll have a reasonable discussion. Tell an Australian and you’ll have World War III. Been there, done that! 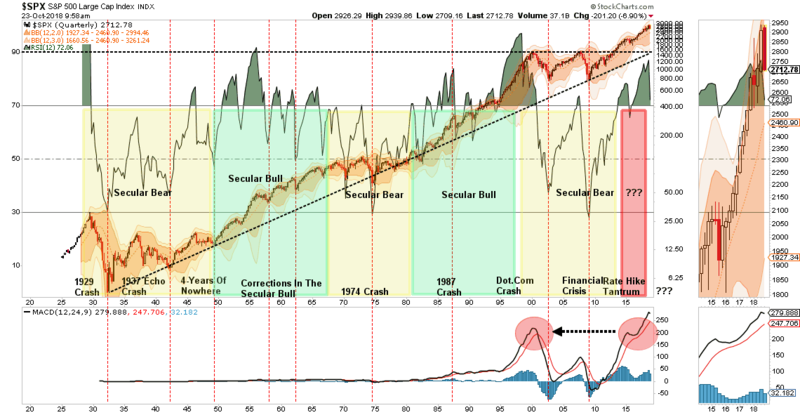 And in a real stock bubble like that of 2000, bearish news in the U.S. will be greeted like news of the bubonic plague; bearish professionals will be fired just to avoid the dissonance of hearing the bear case, and this is an example where the better the case is made, the more unpleasantness it will elicit. Here again it is easier for an individual to stay cool than it is for a professional who is surrounded by hot news all day long (and sometimes irate clients too). Not easy, but easier. But on rare occasions, try hard to be brave. You can make bigger bets than professionals can when extreme opportunities present themselves because, for them, the biggest risk that comes from temporary setbacks – extreme loss of clients and business – does not exist for you. So, if the numbers tell you it’s a real outlier of a mispriced market, grit your teeth and go for it. This goes against the natural psychological behaviors of humans. 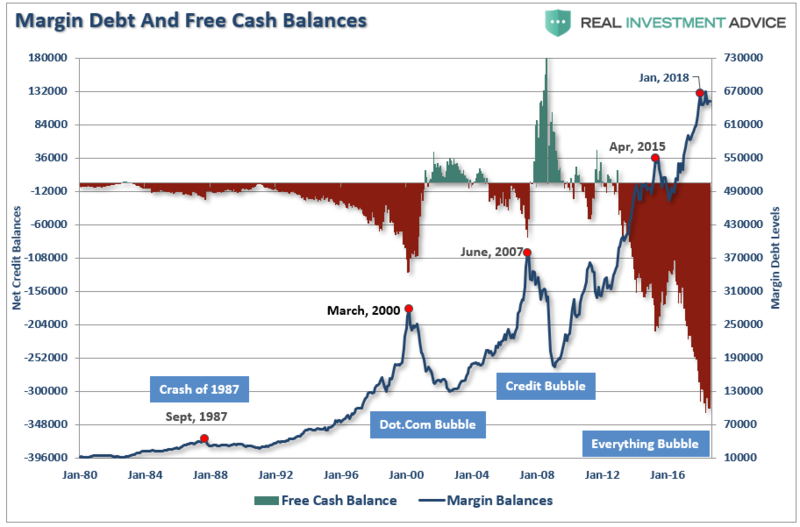 Remember too that for those great opportunities to avoid pain or make money – the only investment opportunities that really matter – the numbers are almost shockingly obvious: compared to a long-term average of 15 times earnings, the 1929 market peaked at 21 times, but the 2000 tech bubble peaked at 35 times! Conversely, the low in 1982 was under 8 times. This is not about complicated math! In the end it’s quite simple. Really. 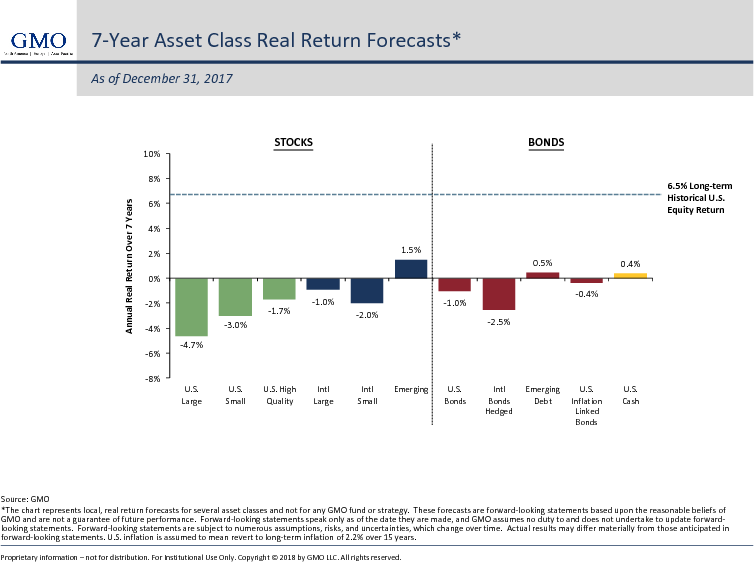 GMO predicts asset class returns in a simple and apparently robust way: we assume profit margins and price earnings ratios will move back to long-term average in 7 years from whatever level they are today. We have done this since 1994 and have completed 40 quarterly forecasts. (We started with 10-year forecasts and moved to 7 years more recently.) Well, we have won all 40 in that every one of them has been usefully above random and some have been, well, surprisingly accurate. These estimates are not about nuances or PhDs. They are about ignoring the crowd, working out simple ratios, and being patient. (But, if you are a professional, they would also be about colossal business risk.) These forecasts were done with a robust but simple methodology. The problem is that though they may be simple to produce, they are hard for professionals to implement. Some of you individual investors, however, may find it much easier. “This above all: to thine own self be true.” Most of us tennis players have benefited from playing against non-realists: those who play to some romanticized vision of that glorious September day 20 years earlier, when every backhand drive hit the corner and every drop shot worked, rather than to their currently sadly atrophied skills and diminished physical capabilities. And thank Heavens for them. But doing this in investing is brutally expensive. To be at all effective investing as an individual, it is utterly imperative that you know your limitations as well as your strengths and weaknesses. If you can be patient and ignore the crowd, you will likely win. But to imagine you can, and to then adopt a flawed approach that allows you to be seduced or intimidated by the crowd into jumping in late, or getting out early, is to guarantee a pure disaster. You must know your pain and patience thresholds accurately and not play over your head.